Manufactured to Swiss level quality, precision and standards, JUUK's premium Apple Watch bands are the only choice for extremely well-made, uniquely-designed aluminum bands for your Apple Watch. We use hard anodized 6000 series aluminum and solid 316L stainless steel deployant buckles. Instead of cheap push pins where you'd need to take it to the watch shop for adjustment, we custom developed our own capsa pin system as well as a proprietary adjustment tool that comes with each unit, so that you can adjust it easily and quickly, right out of the box. Please visit our website's FAQ section on how to use this simple tool. 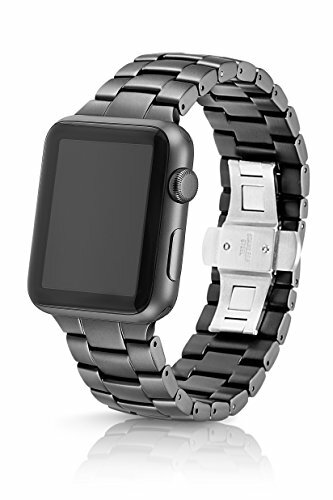 The connectors are custom designed and developed to perfectly fit the Apple Watch, as well as seamlessly integrate into each band's unique design. We go to great lengths to refine the smallest details. Because this link design is longer, we've incorporated a 10 degree drop angle on the connector piece after extensive testing. This minimises the gap between the first two links, and will offer a better fit for most wrist sizes. Also of note is the fact that we have full sized removable links at 8mm, but much less common among the cheap bands, we've also designed 2 smaller 5mm removable links. What this means is that the different combinations of removable links has vastly increased from just taking out multiples of 8mm, to the possibilities of taking out 5mm, 8mm, 10mm, and 13mm gaps...so ultimately this gives you a lot more, finer adjustment options to fit your wrists. These seemingly small details all add up to a fantastic experience to meet our goal of transforming the Apple Watch from a cool tech gadget to use into a timepiece you'll love to wear. We achieve this through strict quality acceptance standards and just as importantly, we partner with factories that also manufacture for major Swiss brands. We come from the watch industry, so this is all we know, but we know it very well. Read our reviews online and you'll see what we mean!